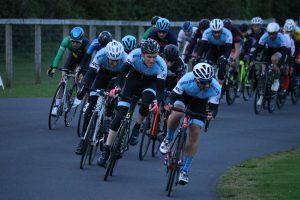 Both the men’s and women’s senior races were dominated by aggressive team tactics in the first round of the Odd Down Summer Series. Bristol RC’s James Phillips took the win from a breakaway that featured his teammate Andy Edwards in the men’s race and Winter Series overall winner Lauren Johnston (Avid Sport) capitalised on team support in the chasing bunch to take her attack from the gun all the way to the win. The men’s races on Tuesday were run in the tougher weather conditions, with the wind ripping the group to pieces in both races, almost a staple for racing at Odd Down in the last few seasons. Bristol RC were able to make the most of this opportunity to lock the race down along with Bikestrong-KTM and dictate the racing to the rest of the bunch. They didn’t have it all their own way though, with Bath CC and Portishead CC also having good number in both races, and these teams got their reward with Portishead picking up second place in both men’s races (Simon Gaywood & Ben Jones). Bath CC’s Duncan Lancashire was the final rider on the podium in the 2/3 race. Sam Lindsay took the win in the 4th cat race, with Alan Adams (University of Bath CC) finishing behind Jones in third. There was the largest ever women’s field at Odd Down on Thursday, split into three races. The 4th cat race was dominated, as expected by India Lee. She rode away from the field at the recent Somer Valley CC event and pulled the same trick again this time. Behind, the bunch were also racing aggressively, with the bunch splitting into three groups and the Army Cycling Union dominant in the first chasing group behind Lee. Their riders were able to lock out the rest of the podium spots with Sophie Barnes finishing ahead of Stephanie Parsonage. The Vets’ race was also raced hard, splitting the race into two groups with Miriam Whitehurst (Somer Valley CC) confirming her status as the only 2nd cat rider in the race, taking the win ahead of Maria Powell (Radeon BikeScience). In the chasing group, the VeloVitesse riders had the upper hand, with Amanda Karlsson and Karen Whyte taking third and fourth ahead of Karen Spiteri (Avid Sport). The women’s E/1/2/3 race flew out of the start, with Johnston’s early moved marked instantly by Charlotte Berry (VeloVitesse). The chasing bunch were not letting them go easily however, and Forever Pedalling lead the chase for the first four laps, with the gap hovering between three and five seconds. The leaders did not desist however, and as their teammates’ presence in the main group began to weigh on the pursuers the gap slowly grew. Lucy Driver (Forever Pedalling) went to bridge but the pair were out of reach and soon the peloton were racing for fourth. Berry is a well-established sprinter, and it looked to be advantage to the VeloVitesse rider as the final laps approached. Berry had got the better of Johnston at Ashton Down in April, but Johnston had learnt from the experience and now according to Berry “used my own tricks against me” and got herself in prime position on Berry’s wheel going into the sprint. Johnston had just enough to overhaul Berry with metres to go before the line, and Driver confirmed her position as the strongest rider in the bunch behind as she leapt clear before the finish to take third.